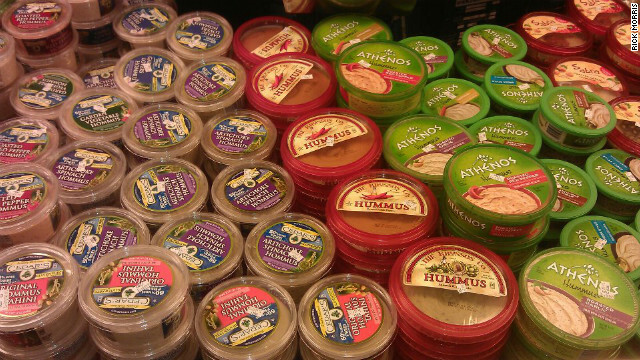 Rick Morris was surprised to find such a selection of hummus at his local grocery store. Editor's Note: Rick Morris is a web developer and volunteer firefighter from Canton, North Carolina. 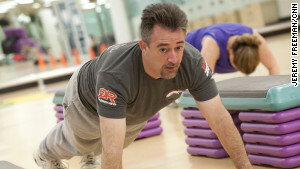 He is one of seven CNN viewers selected to be a part of the Fit Nation Triathlon Challenge program. Each athlete receives all the tools necessary to train for and compete in the Nautica Malibu Triathlon this September, alongside Dr. Sanjay Gupta. The seven athletes met up two weeks ago in Atlanta for the official kickoff of the program, where Rick developed a new taste for hummus. Hummus. The very word, for those like me, not in the know, sounded like a foreign term for something gross. Globular pustules on a teenager's face. A backwoods verb for singing under one's breath (“hummus a song, Cooter”). Perhaps a brand of automobile. “Want some hummus, Rick?” they asked. Atlanta's crowded Flying Biscuit restaurant went near silent for a moment that day, my friends. A myriad of eyes in disbelief angled my direction. I'm pretty sure the winds outside got angry and old-man winter was preparing a cold blast of disdain to lash at me the moment I walked out the door. It clearly didn't appear to have tomato in it (I can't stand tomatoes), and hey, I was pretty hungry so I grabbed a triangle of pita bread, spread a generous amount of hummus on it, and sent it down the hatch. Well, maybe not as exciting as all that. But, clearly I had found a new food that was truly like a party in my mouth. It was delicious. Better yet, I've since learned it is very healthy. Amazing! Something that tastes great and is good for you. For someone whose Sunday dinners generally consisted of fried chicken, corn-field beans, smashed taters (if you must ask, you need to visit my area) and sweet iced tea, I had written-off ever discovering new foods satisfying both requirements. As a member of this year's CNN Fit Nation Triathlon Challenge, I was already in the market for good nutrition. So I decided to delve deeper into this hummus thing. I wanted to know exactly where it comes from, what it consists of, and how I could make my own. My research into the wonderful world of hummus began online. Not to be confused with “humus," an organic matter or compost, I discovered hummus is a Middle Eastern bean dip made from a few basic ingredients: cooked chickpeas or garbanzo beans, olive oil, tahini (ground sesame seeds), lemon juice, salt, and garlic. For someone who prides himself in whipping up the best tzatziki around – a recipe given by a Greek friend while in Europe – I'm now fully confident I can create hummus. Just gotta see if my local grocery store has chickpeas. The origin of hummus comes from “himmas” or chickpeas, leading to the Arabic “hummus," then the Turkish word “humus," and finally settling in the West back in the Arabic style of “hummus." As I said earlier, hummus is spelled the way we Americans see it so as not to be confused with the aforementioned English term for dead dirt. Did you get all that? Now that I know what it is made of, I checked out the nutritional information on hummus. Rich in vitamin C and iron, hummus also provides high amounts of vitamin B6 and folate. There is plenty of protein and dietary fiber courtesy of the chickpeas. The tahini (again, ground sesame seeds) contains a healthy amino acid. And, depending on the oil used, you get a nice portion of monounsaturated fats, which improve cholesterol levels – both LDL and HDL. So... how to eat hummus? Apparently, it can be pasted to just about anything – bread, crackers or celery, for example. My initial dish came with feta cheese sprinkled on top. Mmmmmm! I like hummus so much that I think I'll just spoon it until I have more time to ponder the varying recipes and uses. In the West, hummus is typically served cold as an appetizer or dip, and transported to drooling taste buds via a piece of pita or flat bread. In the Mediterranean, you'll almost always see hummus served with a small assortment of dishes precluding the regular meal. That's called a “meze." Fish, eggplant, chicken, and just about any lunch or dinner menu is complimented with hummus. Palestinians and Israelis typically serve it warm, with bread before, during or after any meal. Exotic spices such as cumin, paprika, parsley, excellent olive oil, and mint leaves often garnish hummus in Palestine. I asked a number of my “kin folk” and local residents here in the Canton area and discovered few had even heard of hummus. A couple of them were well versed, but most had no idea what it is. Evidently, we rural, small-town people are the last to know when it comes to international cuisine. Thankfully, this eases my feelings of embarrassment from my initial encounter with hummus. However, it bothers me that so many of us are missing out! Unlike Middle Eastern countries that battle each other for the world's largest hummus dish, Americans are just beginning to discover its succulent taste and various uses. Lebanon, by the way, holds the current record, at 23,000 pounds - set one day in 2010! I've learned that Americans only recently began consuming hummus, with about 15 million eating it regularly by 2008. If my math serves me correctly, that means about 300 million of us were not partial to this simple, delicious dish.Probably because we had never tried it. But, the popularity of hummus has skyrocketed over the past four years and it's safe to assume that about ten percent of Americans now partake in its consumption weekly. Maybe I'll start a chain of hummus-oriented restaurants, introducing this wonder food to all of America. At the very least, a town hall focus group. From what I've discovered, hummus is a miracle food. I can't find anything negative about it. It tastes great, can be fabricated quickly and inexpensively, and contains plenty of nutrient rich ingredients. My endeavor to uncover the mysteries of hummus has me feeling like I just completed a ninth-grade research paper. But that's perfectly fine with me. I've learned enough to confidently rescue the next lay person who asks, “What's that?” In fact, I'll take any moment of culinary humiliation in exchange for the opportunity to discover a delicious new food. In contrast, plenty of visitors to my neck of the woods have frowned at the site of squirrel dumplings. But for those who try them, they are usually hooked. Well, some are just being social. I mean, it is prudent to show appreciation when a moon-shining, outhouse-using, up-the-holler-living Appalachian tosses their finest culture at you, right? Back to that restaurant in Atlanta... as my glorious moment of hummus introduction came to its climax, our waiter was busy inquiring about our libation for the meal. “I'll have a Pepsi,” I requested. Strike two! “Don't you know this is the Coca-Cola capital of the world?” she asked, as the ground settled to a minor rumble. “The Coke Museum is just a few blocks away!” another proclaimed. P.S. – If you have a good hummus recipe, comment about it below.